Lighting will play a big role in your mood and productivity throughout the workday. You might be able to avoid the ugly cubicles and harsh fluorescent lighting at a corporate office. However, now is the time to check your home workspace. This important area may be lacking in the appropriate amount of lighting to make completing tasks comfortable throughout the day. The effort you put into the comfort and aesthetics of your home office is important. After all, you’ll be stuck there at least a few hours a day and you may as well make it easy on the eyes. Take the time now to analyze and decide which lighting solutions are the right choice for your workspace. This is going to help avoid eye strain and other problems caused by inappropriate lighting choices. Let’s take a minute to think about the basics before we delve into the different types of lighting and lighting fixtures available on the market. We all know that light can affect our mood, productivity, and even our sleep patterns. Our bodies’ natural circadian rhythm was made to respond to changes in light, regulating our sleep and metabolism. While electric lights are convenient, they throw off our natural cycles of wakefulness and sleepiness causing slowed productivity. This means the ideal lighting set up, regardless of the situation, is a room flooded with natural light for a large portion of the day. If you are lucky enough to have a room with long hours of natural light, make sure to place your desk or workstation facing the light source and avoid covering windows. Of course, unless you are sensitive to light. Unfortunately, not everyone is lucky enough to have the perfect naturally lit room. If your home office falls short of this idyllic description, there’s still hope. With a few smart considerations, you can make your workspace a healthy and comfortable environment that promotes productivity and elevates your mood. First, consider the type of work you do. This is a crucial step in finding the right lighting for your home office. Do you work primarily with on a small laptop or on a larger setup with two big monitors? Are you frequently consulting paper books or manuals which require lots of light to read? Do you work with your hands as an artisan or illustrator working with non-digital media? All of these scenarios require a unique lighting solution. For instance, if you have a lot of screens. It is best to avoid overhead lighting since these fixtures can create unsightly glare that is harmful to the eyes. Or an adjustable task light is ideal for artists working with paper-based media or those frequently working with books and paper. Another important consideration is your own personality type. Research has shown that people who are anxious are typically more light-sensitive compared to people who do not report high levels of anxiety. Light sensitive people might be more productive without all the added stimulation bright lights provide. If you feel overstimulated and scatter-brained while in workspaces lit with bright fluorescents or other types of harsh, white light, try a cozier set up with dimmer switches or warmer tinged bulbs. You can also stick to natural lighting if you find that excessive brightness interrupts your workflow. Of course, there are those who thrive under bright, white lights and prefer an intensely lit room to a dimmer one. Try out a few lighting scenarios to find out which type of room works best for you before you make a final decision for your home office. And if you do benefit from brighter lights, research has also shown that you can combat sleepy feelings in the morning with brighter, blue-hued bulbs. Once you’ve taken your workspace and personality into consideration, it’s time to take a deeper look at the magical invention that allows your home office to be illuminated regardless of time of day, number of windows, or orientation toward the sun. Not all lighting is created equal. Taking the time to learn about the different types of light bulbs on the market will help towards creating your perfectly lit workspace. CFL stands for compact fluorescent lighting. The older versions of these bulbs were riddled with the same problems of your typical corporate office fluorescents. Tech advancements made with these bulbs have largely eliminated some of these problems. However, their still always seems to be a gremlin in the bunch. Drastically reduce the amount of electricity needed to power them when compared to older incandescent bulbs. Come in a variety of whites, ranging from daylight (a bright, neutral white) to very warm, cozy white. Given their energy efficiency, cost-effectiveness, and ease of use, they are a great choice for replacing outdated incandescent bulbs. Despite the many great benefits of CFL lighting, experts disagree on whether or not these bulbs can cause headaches in some users. Researchers have even reported that some CFLs can even scatter radio frequency radiation into a room. This can cause symptoms ranging from migraines to fatigue, and in some instances, even dizziness. 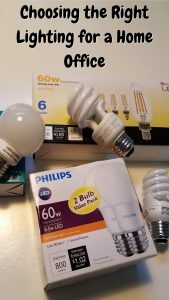 If you are a frequent migraine sufferer and find that CFLs aggravate your symptoms, these may not be the best bulbs for you. CFL bulbs also contain toxic mercury, making them potentially dangerous when broken, creating a hazardous situation for pets and little ones. LED lights are the most advanced form of lighting commonly available today. The acronym LED stands for light emitting diode. Like CFL bulbs, LEDs are much more efficient than their incandescent predecessors. But LEDs are even more efficient than CFL bulbs, using 75% less energy than the old incandescent light bulbs. Amazingly, they can also last up to 25 times longer. Unlike CFL bulbs, LED lighting does not contain mercury, a toxic chemical. The main problem with purchasing LED lighting is their upfront cost. Although they can save a homeowner a considerable amount of energy costs throughout the year. This very quickly pays for themselves once you get past the sticker shock when first making the switch to LED lights. LED lighting is also environmentally friendly. They produce no UV emissions and most are 100% recyclable. Everyone needs to make supporting the environment part of a home office mission. LEDs are a fantastic choice for this cause. Even if you are light sensitive and prefer a less illuminated workspace, LEDs also offer maximum flexibility. LED also offer light strips which are a neat and inexpensive way to modernize your workspace aesthetics. They are usable even if you are sensitive to bright lights. Currently, a 16’ flexible strip of color changing LED lights complete with a remote control, runs just under $20. Are you ready for your next DIY project? Once you’ve decided which type and temperature of lightbulbs the use, the next step is to choose the fixtures your new bulbs will be housed in. Choosing an appropriate combination of lighting fixtures can be a challenge for any room, but it is especially important when decorating a home office. The type of work you do, as well as the time of day you prefer to do it, can be crucial deciding factors when choosing fixtures. If you have the ability to modify overhead lights, changing the location of the overhead light from the center of the room to other areas can have a dramatic effect.In these instances, recessed lighting will give your workspace a modern, customized feel. Place them at regular intervals above your desk for a direct light effect. If you are more light sensitive, you will want to space them irregularly throughout the room for a soothing and contemporary constellation effect. Recessed lighting also works effectively for smaller workspaces where you might not have enough space for desktop light fixtures. If you do have enough desk space for a desktop task light or an accent lamp, these are great options to maximize the flexibility of lighting in your home office. Adjustable task lights are great for studying books and manuals since you can position them directly above your reading material. They also work well for the light-sensitive as you now have the ability to turn off overhead lights. Allowing you to focus your attention directly on your work with a task light. Accent lamps also work to soften the aesthetic of your workspace by diffusing harsh, exposed bulbs. Place warm white bulbs of either type in your accent lamps for a cozy effect. And for a really futuristic look: place strips of long-lasting LEDs onto bookshelves or behind your desk for focused ambient lighting that really pops. Maximizing the mood and productivity-boosting effects of great workspace lighting doesn’t have to be hard or expensive. Take some time to analyze your work and workspace. You can easily draft a plan to make better use of existing natural light or supplement it with energy efficient bulbs and handy fixtures that fit within your budget. Even for those who find bright light overly stimulating and distracting will benefit from a few well thought out lighting solutions to illuminate their workspace more effectively. Whether you want to fully remodel your workspace or simply add a few adjustable task lights, there’s no reason to suffer through yet another poorly lit, unproductive work day. What are you waiting for? Get to work on making your workspace the best it can be!